Contest: Concert Photo Contest - Sixth Winner! This is starting to get hard. We are starting to get more contest participants as far away as the U.K and Poland! 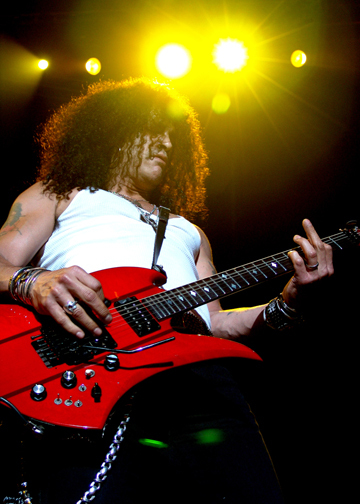 This shot of Slash performing with Velvet Revolver at the Verizon Wireless Amphitheater in San Antonio in 2005 to the left won a T-Shirt in week 6 for longtime austin music photographer Gary Miller. Gary's work has appeared in so many places over the years it would be too numerous to list here, but he is the house photographer for a number of large venues in Texas as well as a photgrapher for the Austin Chronicle and his collection of photos goes back decades. We will be profiling a number of photographers that have submitted works once the contest has ended, hopefully Gary will submit to one of these profiles. It is far from over though. The photos from Poland will be tough to beat! Watch for week 7's winner to be announced later this week. Slash is ALSO probably one of the most famous rock & roll snake keepers for all you reptile heads tuning in from our main site. Thank you Jeff for the write up and for choosing my photo. I would like to say that while I know this contest is open to everyone, even pros, by no means do I make a living at it(it's not even half of my yearly income). I do get paid to take pictures but I have only one camera and 2 lenses to do all my work and am really excited about the possibility of getting another camera as a backup through this contest. Thanks again. And I think you are right about the Poland photos, they are awsome. As well as Jaywest2006.